To make a collection appear on the main menu bar of a Shopify store, you need to create a navigation link. 1. Go to the "Online Store" sales channel. 2. Go to the Navigation page. 3. Click on the "Main Menu". 4. From the newly opened page, click on the purple button "Add menu item". 5. From the pop-up window, give a name for the navigation link. 6. 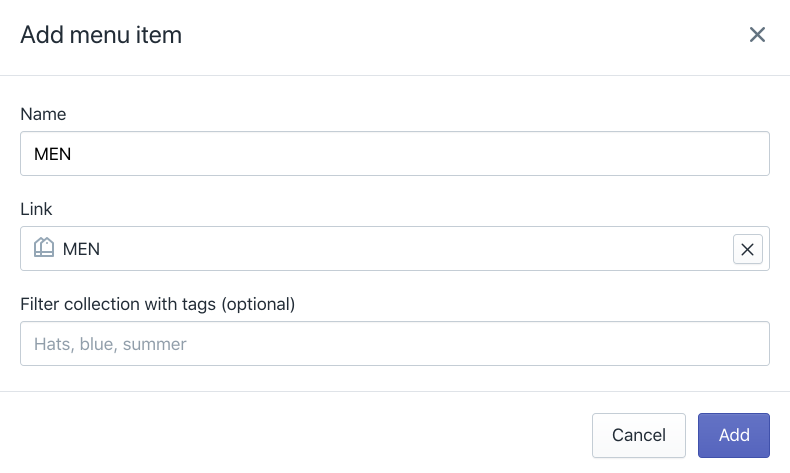 In the "Link" field, choose "Collections" and find the needed collection. 7. To confirm, click "Add". 7. Finally, to save all the changes, click "Save".